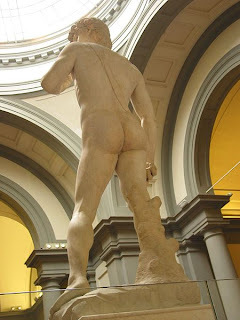 We can't all look like Michelangelo's David but we can strive for it right? So I've been Spinning® for a number of years and just can't seem to get to my next level of goals. I think I'm doing okay with my diet, I'm in the gym 3-4 days per week, but nada. Nothing. Zip! ZILCH! No change. So if I want to change, and I do; then I must change something. That's what initiated my RIPr™ series to see if the change could do me good. According to the information gleaned from a number of sources, I've determined that I wanted an Interval Session with a heavy strength component. 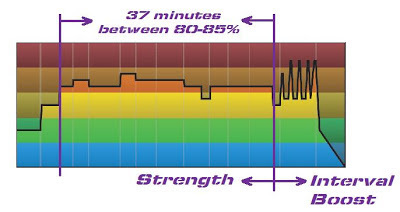 The Interval is to get me a bonus burn of calories (200+), while the Strength component is intended to create "micro-trauma" to the muscles. Tack on a little extra protein in my diet, and I should be building muscle. During that building process you get an estimated extra 100 calories torched / day; plus now the increased lean muscle mass should be generally good for your metabolism. That's the theory anyway. You can read more about it in my previous blog post. So here I am 2 days after my first RIPr session and I feel it. Something is definitely different - I'm sore. My quads, a little, but my glutes feel like they did after the first week I went Spinning®. While being sore isn't the objective, it does represent a different stressor on my body, which means the potential for change. The profile is going to look very close to the last one, and to the next one (by design), but I like to change up the music so new music means refreshed energy in the room. If you're doing this with me, don't forget to protein load within 30min of the ride and include some complex carbs to keep your energy level from plummeting. so a cover band version is linked above.